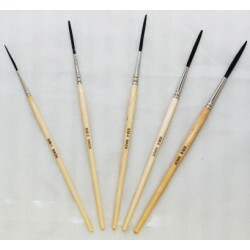 Buy them here, Mack Brush series-838 Out-liner Brushes are made from natural Blue Squirrel and Black Ox mixture hairs. They have a nickel ferrule and plain varnished wooden handles.Hair is very strong, but will not hold as much paint as Mack Series 839 Out-liners. The 838 Out-liner brushes are used for outlining letters, for scroll work, and applicable sign work.The brush series-838 & 839 is suitable for most surfaces. It has a round ferrule and graduated hair lengths. Mack Brush series-838 Out-liner Brushes.